October is a transition month in the garden, with median first frost date mid-month, plants dying back, seeds dispersing, birds flocking and feeding on fruits and seeds, peak fall color, and more changes on the land. 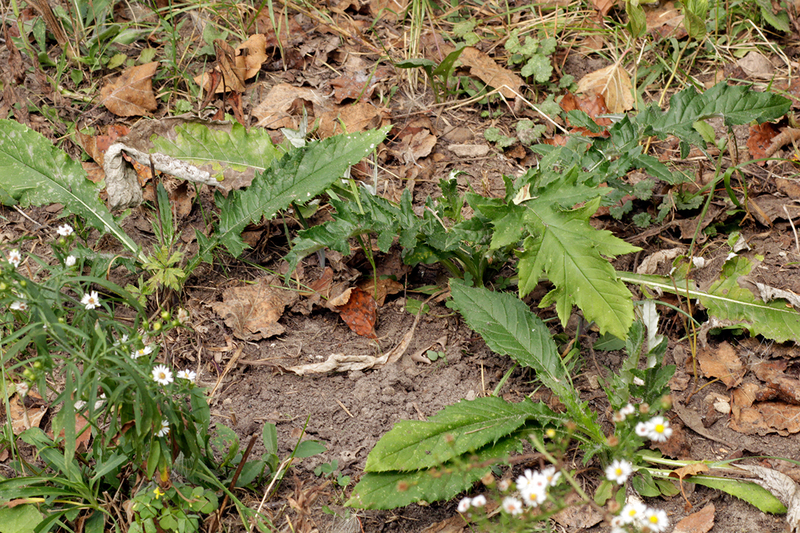 While above-ground plant growth is limited to cool season grasses, weeds, and rosettes, root growth for many species continues until soil temperatures drop. Garden tasks include seed collecting, some weeding, mulching, and checking the garden for changes or additions in advance of winter plant orders. We always find a few native species growing in the native plant garden that we have never ordered or planted. These are mainly members of the sunflower family, with numerous wind-dispersed seeds, which scatter at this time of year. Frost aster (Symphyotrichum pilosum), Canada goldenrod (Solidago canadensis), white snakeroot (Ageratina altissima), and field thistle (Cirsium discolor) are familiar examples. Unless they have been harvested, this month you will find tall stalks of field thistle in the garden and prairie. 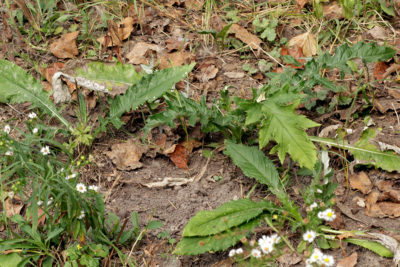 Those individual plants are now dead, but the life cycle continues with seeds, seedlings, rosettes, and then a tall plant that flowers, usually in 2 years. 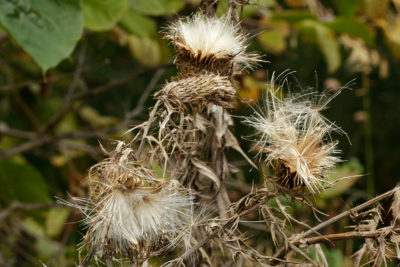 While native thistles may be tall and produce many wind-dispersed seeds when they flower, they are not aggressive and have excellent wildlife value. The Arboretum is home to swamp thistle (Cirsium muticum), in shaded wetlands and a State threatened species Hill’s thistle (Cirsium pumilum var. hillii), on a dry site. In the native plant garden, field thistle is found in sunny areas, like the prairie gardens, parking circle garden, and children’s garden. In light shade, it remains small and produces few flowers. It does not establish in medium and deep shade. A new comprehensive resource, now available online from the Xerces Society for Invertebrate Conservation, describes the value of thistles to a wide range of pollinators, other insects and wildlife, and offers guidance for propagation and seed production. This conservation guide has practical information for home gardeners as well as anyone doing nursery/field production on an agricultural scale. Thistles host a wide diversity of native herbivorous insects, including thistle specialists feeding on stems, leaves, seeds, and flower parts. Hummingbirds, butterflies, and moths make use of the rich nectar source, and we often find two or three bumble bees on flower heads. Native field thistle often blooms during August, when few other plant species may be in flower. Goldfinches nest late in the season, in July and August. 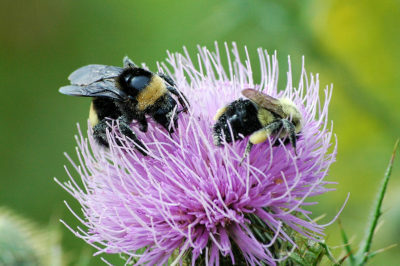 They feed on thistle seeds, and use fibers on the seed heads (thistle down) to line their nests. Unlike other birds, goldfinches feed seeds (not insects) to their young, so their life cycle requires adequate late-season seeds and grains. In contrast to the native thistle species, non-native perennial Canada thistle (Cirsium arvense) is invasive, and is listed as an official noxious weed in the state. We work to control its spread and reproduction in the garden. Bull thistle (Cirsium vulgare) is another non-native that seeds in occasionally, but is easier to control because it is biennial rather than perennial. Take time to know and grow thistles and enjoy October in the garden!